UPDATE: On 10 Aug 2017 the FAA issued AD 2017-16-11, which mandates compliance with Lycoming Mandatory SB 632B, effective 15 Aug 2017. Although the FAA has issued this AD as a final rule you may leave a comment at the link above. On July 23, as many thousands of GA aircraft owners were converging on Oshkosh for AirVenture 2017, Lycoming published Mandatory Service Bulletin 632A titled Identification of Connecting Rods with Non-Conforming Small End Bushings. This is a very nasty service bulletin that will affect thousands of Lycoming engines of all models. SB 632A addresses a problem with small-end connecting rod bushings (part number LW-13923) that were used shipped by Lycoming to overhaul shops and mechanics between November 2015 and November 2016. It turns out that there was a quality assurance problem with these bushings, and some of them had an outside diameter that did not conform with specifications. These bushings are pressed into the small end of Lycoming connecting rod assemblies using a hydraulic press. If the bushings are too small in diameter, the press-fit isn’t secure and the bushings can migrate out of the connecting rod when in service. That’s exactly what seems to be happening to a relatively small percentage of these non-conforming bushings, and it’s what prompted Lycoming to issue its mandatory service bulletin. Lycoming used these bushings in-house to build connecting rod assemblies, some of which were sold to overhaul shops and mechanics between November 2015 and February 2017, and most of which went into Lycoming factory new and rebuilt engines. Any engine that has these non-conforming bushings, whether built by the factory or overhauled or repaired in the field, are affected by SB 632A. We actually don’t know how many thousands of engines will be affected because both Lycoming and the FAA have so far declined to release this information. We do know it will affect well over 1,000 Lycoming factory new and rebuilt engines, but it will also affect a large but unknown number of Lycoming engines that have been overhauled or repaired in the field over the past two years and that number is difficult to estimate without data that Lycoming has shared with the FAA but has so far been unwilling to share with anyone else. Why is SB 632A so nasty? SB 632A requires that all engines that might possibly contain these non-conforming bushings have all their cylinders removed within the next 10 hours. 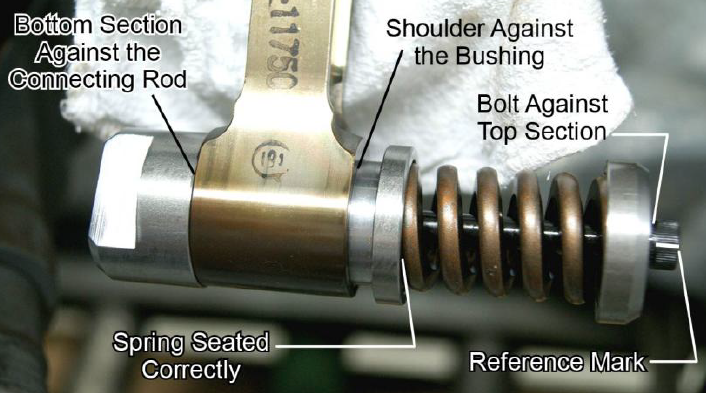 With the cylinders removed, the securing of all small-end connecting rod bushings then must be tested using a special tool (“ST-531 Connecting Rod Bushing Press-Out Verification Tool”) to apply a calibrated force to the each bushing to see if it can be displaced. If the bushing moves during this press-out test, then the connecting rod assembly must be removed from the engine and sent to Lycoming, and a new connecting rod assembly with a known-good bushing must be installed. Lycoming estimates that the press-out test will have approximately a 20% flunk rate, which means that one in every five connecting rods may need to be replaced. This is a horrifying prospect. The requirement to remove all cylinders within 10 hours is bad enough; there is a long history of catastrophic engine failure after removal and replacement of all cylinders in the field. But the prospect of having 20% of the connecting rods removed and replaced in the field represents a far greater risk, because the majority of mechanics have never before performed this operation (notably tightening rod bolts to a specified stretch using a special micrometer). The rod bolts are the most highly-stressed component in the entire engine, and tightening them properly is ultra-critical. In my opinion and the opinion of every highly experienced A&P/IA I’ve spoken with, this is NOT work that should be attempted by line mechanics in the field working on engines mounted in airplanes. It really should be done only by an experienced technician in an engine shop with the engine mounted on a stand with unencumbered access. In short, we believe that the cure published by Lycoming (and in all probability soon to be mandated by the FAA) may be far worse than the disease. We think it’s quite likely that there may be more catastrophic engine failures caused by maintenance errors in performing SB 632A than would be caused by the migrating bushing problem that SB 632A is addressing. We also believe that there is a far less invasive and risky and expensive method that would effectively detect bushing migration and mitigate the safety risk without creating a bigger one in the process. While in Oshkosh, I sought out AOPA’s David Oord, with whom I’d recently worked so successfully on dealing with the Continental camshaft gear issue. I told Dave that the FAA had not issued an Airworthiness Concern Sheet (ACS) about this Lycoming bushing issue in order to solicit input from the affected aircraft owner associations (as they had promised to do when we met with the FAA Engine and Propeller Directorate at a GA engine summit meeting in 2015), and I suggested that AOPA ask the FAA to do that so we would have a reasonable time to research this issue and provide the FAA with a thoughtful response before their AD process began. Dave promised he’d make some calls to the FAA on Monday (July 31) and request an ACS. On Tuesday, I spoke with Dave by telephone. He told me that he’d heard back from the FAA, and that they said they would not be able to issue an ACS because they considered the issue too time critical. It seemed likely that the FAA was thinking about issuing an emergency direct-to-final-rule AD and bypassing the usual NPRM and public comment period. Dave insisted that input to the process from the aircraft owner community was essential, and the FAA agreed to try to set up a conference call between aircraft owner representatives, key FAA personnel, and representatives of Lycoming. On Wednesday morning, I was awakened by a phone call from Dave, who told me that the FAA was willing to do a conference call, but it had to be TODAY. Yikes! I told Dave I’d contact some qualified aircraft owner representatives to be on the call (including Paul New representing the Cessna Pilots Association and Steve Ells to represent Piper owners). Meantime, Dave reached out to Jonathan Sisk of the Malibu/Mirage Owners & Pilots Association. All agreed to participate the call. The call was scheduled for 3 pm Eastern, noon Pacific. I spent two hours drafting a bullet-point document containing our questions, concerns, and proposed alternative solution to SB 632A, and emailed it to Dave, who sent it to all the participants expected to be on the call. They included Aaron Spotts and Jennifer Miller of Lycoming, Cesar Gomez and Norman Perenson from the FAA’s New York Aircraft Certification Office (ACO), and Christopher Richards of the FAA’s Aircraft Certification Service. Lycoming would not tell us how many displaced bushings have been found, how many connecting rod failures had occurred due to bushing displacement, what the distribution of engine times was when bushing displacement was detected or connecting rod failure occurred. They would not tell us how many engines they expected to be affected (although the number is clearly in the thousands). They would not even tell us how much the special ST-531 press-out tool would cost, or how soon they could get enough of these tools out in the field to perform the required test. We spent the rest of the time on the call trying to convince Lycoming and the FAA that there was a far less invasive and risky and costly way to deal with the displaced bushing problem, and we described it to them in detail. But my impression was that we achieved no traction, and that Lycoming and the FAA had already decided that SB 632A was necessary, despite the maintenance-induced failure risk. You cannot imagine how frustrated and disgusted I felt at the end of this call. Dave, Paul, Steve, and Jonathan felt the same way. On Thursday, we worked with Dave to create a formal joint letter to the head of the FAA’s New York ACO. In it, we expressed our disappointment in how the FAA seemed to be dealing with this issue, and included the bullet-point document I’d created outlining our questions, concerns, and recommended alternative to SB 632A. In the letter, we specifically asked the FAA to approve our proposed minimally-invasive alternative as an Alternate Means of Compliance (AMOC). That’s where things stand as I write this. I expect that the New York ACO will convene a Corrective Action Review Board (CARB) next week to decide what corrective action to take. It is my hope that the CARB will give due consideration to our concerns and recommendations, but I am not holding my breath. We will continue to follow this matter closely and keep you informed. In the meantime, my advice to owners of Lycoming engines that might be affected by SB 632A is to perform the research of paperwork to determine whether or not your engine contains any of the potentially non-conforming bushings, but NOT to pull any cylinders or connecting rods yet. Let’s see what the FAA decides. Maybe they’ll redeem themselves by agreeing to approve the AMOC we requested. Just as we were putting the finishing touches on this report, Lycoming issued a revision to SB 632A. The revision clarifies some details but if this becomes an AD it's still going to be painful for many Lycoming owners. Read SB 623B. Published with permission. Mike Busch has more than 50 years of aviation experience, and possesses an unusual breadth and depth of technical knowledge as a pilot, flight instructor, mechanic, inspector, and aircraft owner, with focus on piston-powered general aviation airplanes. Click here for more information about Mike. For questions and comments on this post contact LOBO via email: info [at] lancairowners.com.